Earn $38.50 in VIP credit (3850 points)What's This? 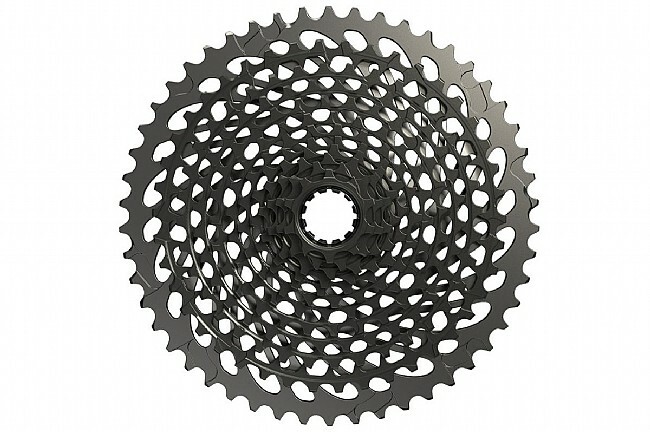 The SRAM Eagle XG-1295 12-speed Cassette features a 50T - 10T spread for a 500% gear range. This incredibly versatile cassette uses SRAM's X-Dome™ construction, with the first 11 cogs being machined from a solid block of chromoly steel for excellent durability, mud tolerance, and a low weight. The alloy 50-tooth cog is then pinned to the main body, and they all feature X-Glide™ 2 cog profiles to improve chain retention and shifting, as well as providing smoother and quieter operation. Compatible with hubs using SRAM XD freehub bodies. Claimed weight is 355 g. Cog sizes are 10-12-14-16-18-21-24-28-32-36-42-50.